Inn Gear is an interiors provider for public houses, hotels and restaurants. Inn Gear make a diverse range of bespoke furniture for interiors of buildings & also refurbish existing furniture for reutilisation. 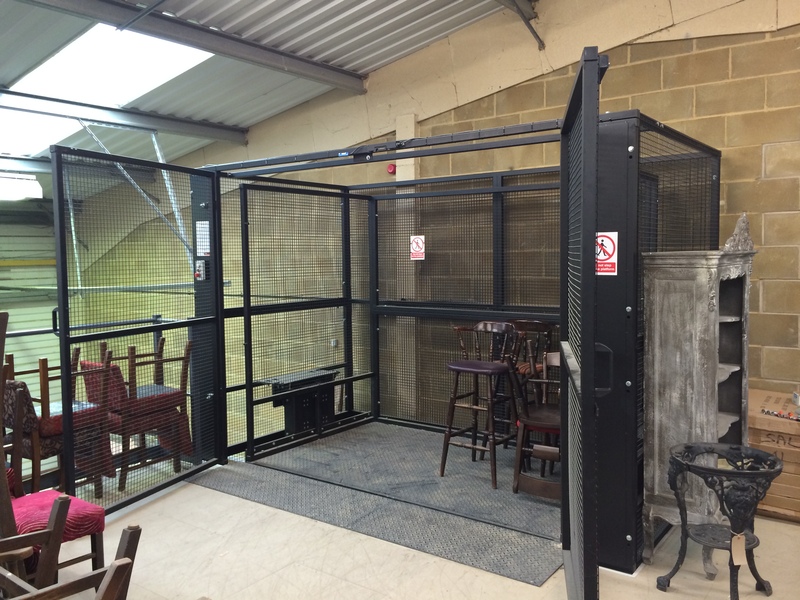 HMF were asked to design 2 bespoke mezzanine floors for Inn Gear located in adjoining industrial units near Salisbury. The design called for piling to be utilised to increase the loading for mezzanine floor columns to be located on the concrete slab with large spans between columns. HMF were asked to design 1 of the units to accommodate a workshop on the ground floor & to integrate the mechanical & electrical design to suit the workshop equipment. The design called for the introduction of extraction systems with ductwork & associated services. The other unit was to be used for storage of furniture on both the ground & first floor mezzanine level & the design was to incorporate a very large lift which could accommodate the furniture to be moved onto the mezzanine floor level. HMF designed the mezzanine floors to be 1 hour fire resisting as they covered most of the unit. Also HMF provided the full fire alarm system to cover both units to BS 5839 Part 1 2002. The lighting provided was sealed humidity IP rated with 3 hour non maintained emergency lighting to BS 5266. The goods lift was designed with a 2.5m wide x 1.5m deep car which enables large quantities of furniture to be moved in one movement. 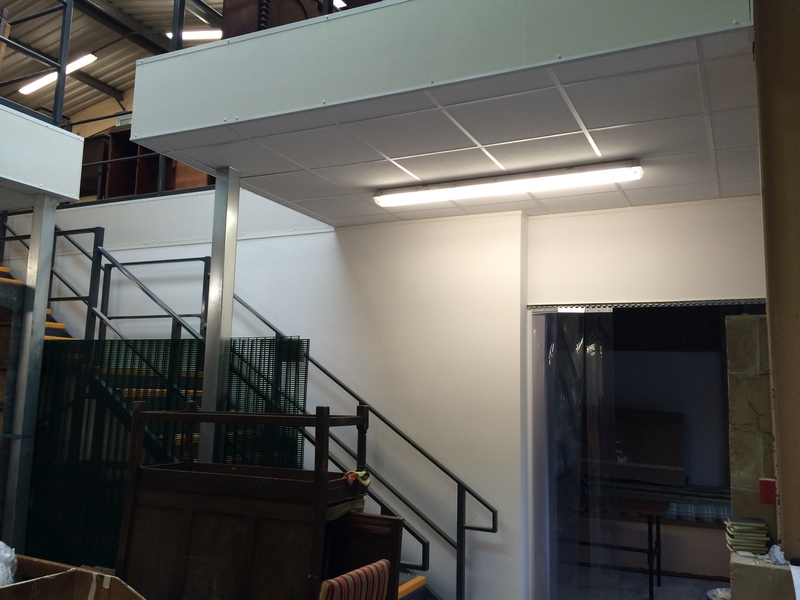 Power to both units was required & HMF provided all the 3 phase electrics, trunking & containment for powering the workshop. fitted around the staircases again with insulation to maximise the energy efficiency of the workshop. 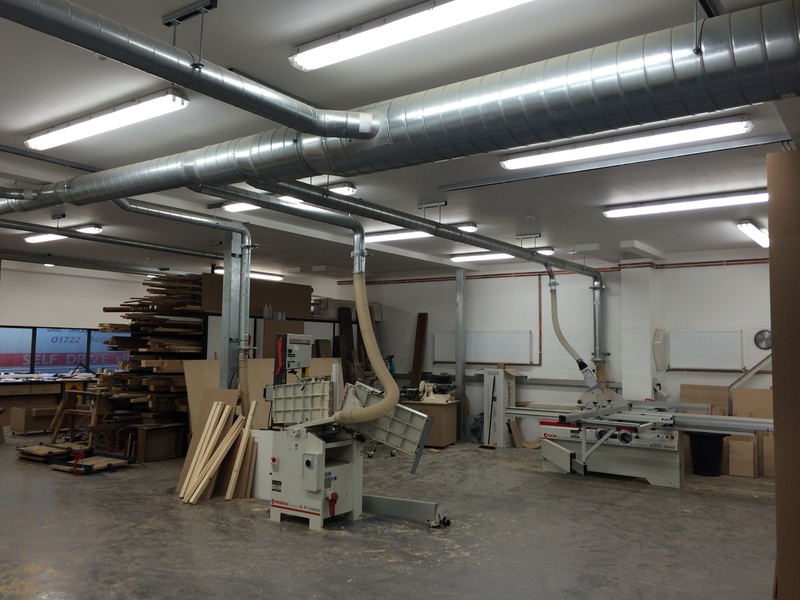 PVC strip curtains were fitted at the entrance to the workshop c/w sliding head track to enable ease of removal whilst ensuring heat loss was not compromised in day to day usage. The existing slab was diamond cut & the ground prepared to accept piling. Once HMF had had the piles fitted re-enforced pile caps were fitted to the top of the pile/slab. The floor in the workshop was primed & epoxy painted with a high build epoxy flooring system with a light aggregate to enhance safety. The works were then completed with final decoration to the walls & ceilings within the workshop to give a bright & enhanced working environment for this area. Access onto the mezzanine floors were by a DDA compliant general access staircase complete with mid landing, handrail with grab rails, closed risers & high visibility nosings. Secondary means of escape was provided by a utility Escape staircase c/w mid landing, & open Durbar steel plate treads. HMF as Main Contractor carried out the complete design & build of the whole project & acted as not only Principal Contractor but CDM Co-Ordinator for the project worth £200k & ensured that the work was carried out safely in a phased build programme over a 5 month period to suit Inn Gear. The installation was complete on programme and Inn Gear are now using the workshop & new storage facilities. The project was completed ahead of the original programme.